Mythical names evoke a special, otherworldly magic. Magical names seem to be filled with mystery and charm even when they are not names of angels per se. So why include names of mythical beings on a site about angels? Mythology and angels are closely related. In fact, angels appear in the folklore and mythology of many ancient cultures. And, to many, angels are the ultimate mythical beings. If you are looking for fantasy names and names inspired by mythical beings, you’re in for a treat. Below you will find a small but intriguing collection of names found in Greek mythology and other ancient cultures. The Oceanids are the three thousand daughters of the titans Oceanus and Tethys. Here are more names of other mythical beings. These come from the mythological traditions of different cultures. Aeval – Name of the fairy queen of Southwestern Munster. 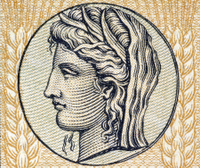 Demeter – Goddess of the harvest in Greek mythology. Ferries - Name of the Shetland and Ocadian fairies. Fetes – Name for the fates in Upper Brittany. Kachina - Name of ancestors spirits among the Pueblo Indians. Mermaid – mythical sea creature. This word comes from Old English mere (sea) and maid(woman). Ondines (alson known as undines) – These are water nymphs in European folklore. Sirens – The name of mythological creatures in Greek mythology. They were portrayed as bird-like women who seduced unwitting sailors with their songs.